Verse and writing often provides a powerful starting point for me. On to the Eastward - the word “maelstrom” was the brief for this piece of work. Edgar Allen Poe’s short story ‘A Descent in to the Maelstrom’ gave me my starting point. 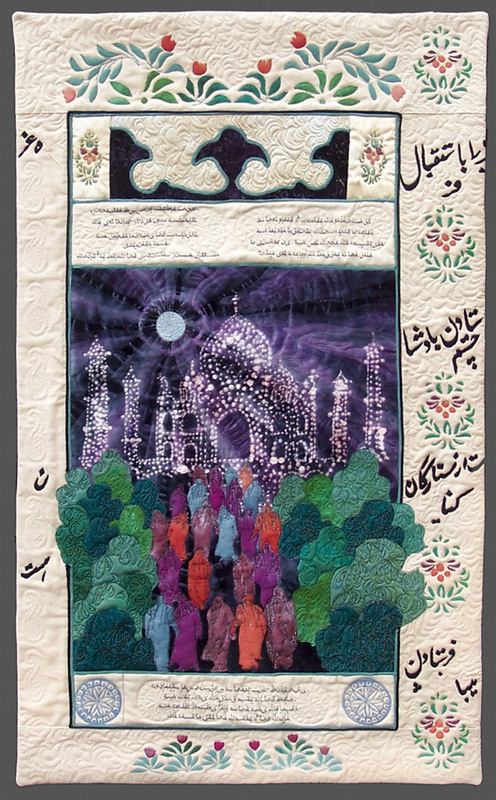 Enchanted - inspired by my first visit to India and the discovery on my return of a photo of my father sitting in front of the Taj Mahal in 1945 and a poem I found in a book published by The Forces which was written by him called ‘Taj Mahal by Moonlight’. August Midnight - the title of delightful short poem by Thomas Hardy. 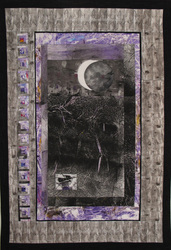 I used mostly recycled fabric – especially velvet which gave just the right texture for the moody summer night. If you look closely you can see the other insects that visited the poet that night, attracted by his lamp and an open window. ‘Listen’ - the fabric for this piece is digitally and hand printed. 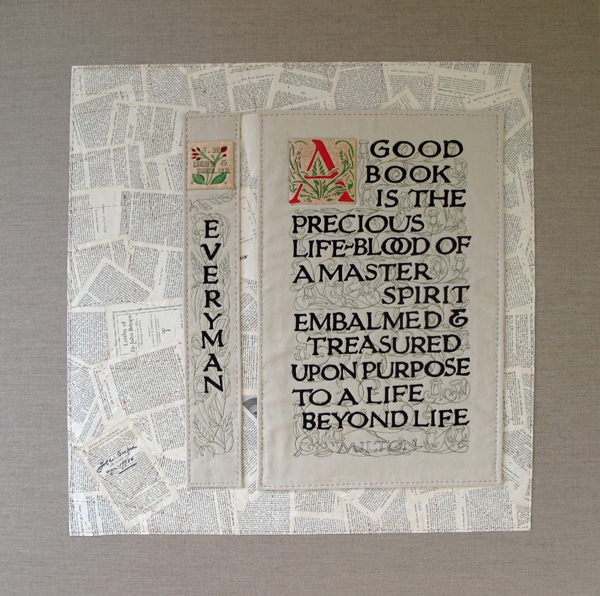 The printed marks on the fabric suggested the title and a verse from ‘The Listeners’ by Walter de la Mare is printed in the border. Gerontius - made for an exhibition in The Weavers Gallery, Ledbury, Herefordshire in 2010. Elgar and ‘The Dream of Gerontius’, written by Cardinal Newman, were the starting points here. It is now hanging in the reception area of York University Department of English and Related studies. 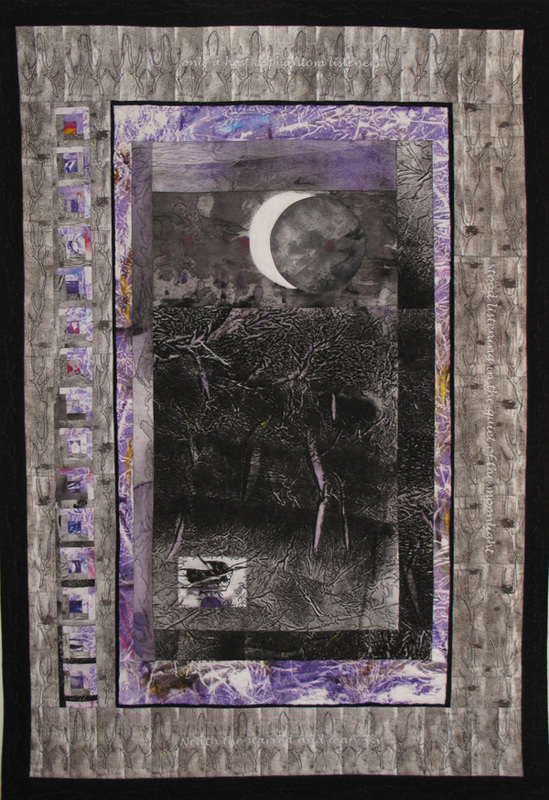 Moon-made friends - made for an exhibition at The Weavers Gallery, Ledbury, Hereford in 2011, focusing on the Dymock poets and takes its inspiration from ‘Iris by Night’ by Robert Frost and his friendship with Edward Thomas. Gaps - a development from ‘Moon-made Friends’. I was looking at negative stone shapes and how I could use them as letters. Tumbling Stones - made after negotiating yet more loose stones which had fallen from the wall into the lane and incorporated text and builders scrim with maybe a touch of irony here. 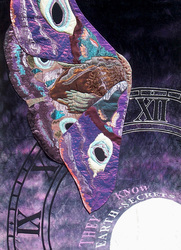 There are also smaller pieces on this theme for sale. 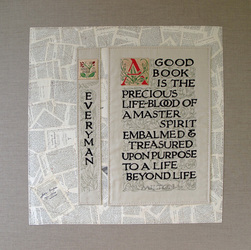 ﻿﻿ A Good Book - A relatives book collection, the signature of someone I knew when very young and a beautiful quotation inspired this piece which is made from pages of a damaged book, stitched together again, the Dent publisher's mark from the spine of the Everyman series of books and an illuminated letter - more appliqué and stitch. 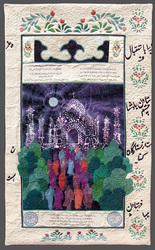 Aedh wishes for the Cloths of Heaven. I woke up very early and this was the dawn light seen from my shed. 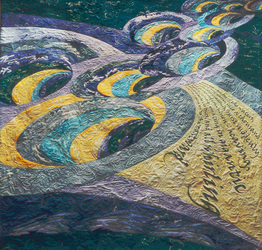 The famous last sentence "Tread softly because you tread on my dreams" is stitched below. 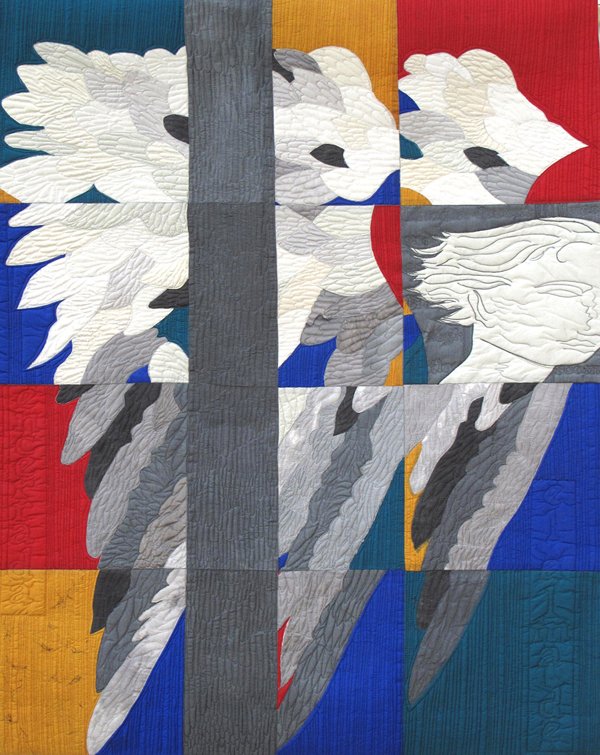 The piece is mounted on an orange velvet background.